There is no date more significant to New York city, than September 11th. Hudson River Park Pier 26 is only a few blocks away from where the Twin Towers once stood. The location was chosen for Givenchy’s first-ever show during New York Fashion Week. The event was indeed a thoughtful tribute to 9/11 created by artist Marina Abramovic, whom designer Riccardo Tisci collaborated with to produce a magnificent show. A Buddhist monk sang a mantra as the guests were arriving at pier. It was a beautiful day and a beautiful scene at the lower Manhattan. The show began with a Jewish religious song, followed by Arabic and Hindu, withLatin "Ave Maria" closing the show. It was so touching and so important for all. Riccardo Tisci and Marina Abramovic wanted to remember the tragedy that happened 14 years ago on September 11th and humanity to unite. It was one of the most phenomenal celebrity gatherings. Among the attendees were Julia Roberts, Amanda Seyfried, Liv Tyler with father Steven Tyler, Kim Kardashian with husband Kanye West, Ciara, Nicki Minaj, Uma Thurman, Christina Ricci, Courtney Love and many more. 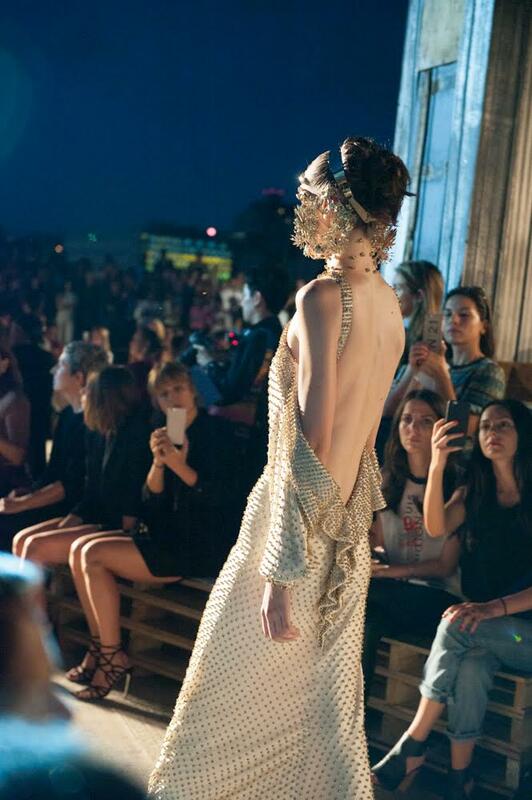 At least 2,000 guests attended the show by a Parisian couturier on the anniversary of 9/11. The collection which included gorgeous lingerie, men's tailoring, phenomenal make up by Pat McGrath was a contrast between elegance and ferocity. It was an honor to be part of this historical event and share it with all of you. Marina Abramovic, Riccardo Tisci and JOLIEGAZETTE will never forget! Proceeds go in support of the devastation caused by the forest fires in California. From Russian San Francisco with Love! What happens when the worlds of Fashion and Art join forces? Murder can be most foul, but that doesn't mean it can't also be thoroughly fabulous. We talk to Plum Sykes, the Author behind Party Girls Die in Pearls. Simon Doonan about his humble background, working with Diane Vreeland, the Swinging Sixties and so much more. Legendary film director FRANCIS FORD COPPOLA joins JOLIEGAZETTE community to talk about his live cinema experiments, his challenges and the greatest hope for the future. Reunited with‘Mr. Luke Cage’ himself, Mike Colter, and director Malcolm Lee (Barbershop: The Next Cut) Deborah with appear in Girl Trip (starring Queen Latifah and Jada Pinkett Smith) due in theaters in 2017. Read more about the rising star Deborah Ayorinde! “Everything I do is a matter of heart, body and soul” ~ Donna Karan. Though she grew up knowing that her grandmother was a film and style icon, Emma Ferrer (granddaughter of the legendary Audrey Hepburn) is a product of self-discovery.